The iPhone XS Max with its large body and well-spaced antennae did best among in reception and download speeds among the phones with an Intel modem inside, but the Qualcomm side ended up with one surprise winner - the LG V40. Armed with professional carrier equipment by Rohde & Schwarz - the type of gear that RootMetrics uses in its USA drive-by tests that Verizon loves to cite - the lab coats from Cellular Insights put six of the most popular 2018 phones to the test. As you can easily deduce from the graphs below, there are pretty negligible differences in reception rates and download speeds, with the cheaper OnePlus 6T diving the lowest in the chart when the signal is good, but bouncing back in weak signal scenarios. For some reason, Google's new Pixel 3 doesn't shine in download speeds when the signal is less than stellar. The LG V40 takes the crown among phones with Snapdragon 845 chipsets and the respective Qualcomm X20 modem which can reach up to 1.2Gbps download speeds. Among Intel-inside phones like this year's iPhone crop, the XS Max did best, while the iPhone XR which sports an older (up to 600Mbps) modem from Intel, did worst. 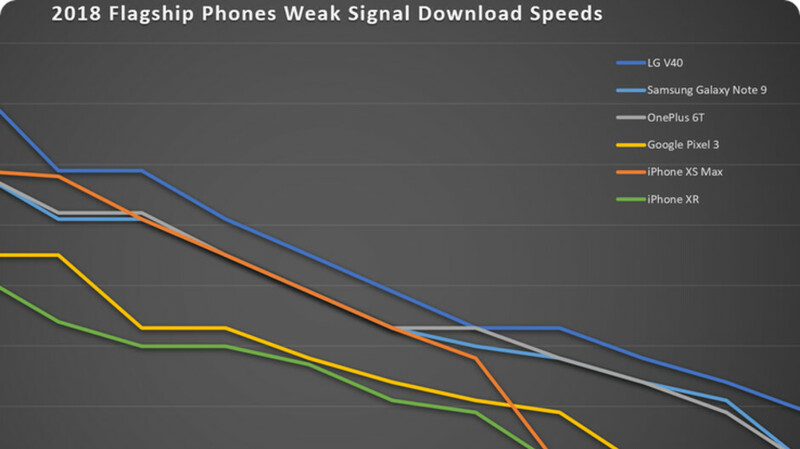 Last but not least, each newer modem version manages to eke out better download speeds compared to its predecessors in the same network conditions, as exemplified by the last, Note 5 to Note 9, chart. Everybody except Apple & Google will come out with a better phone in 6 months. What's your point? Google won't have a new phone until next fall, same with apple. my point is they will revamp the V40 as the V45 in a few months just as they did with the V30 and V35. instead of having an annual updated version. "The iPhone XS Max with its large body and well-spaced antennae did best among in reception and download speeds among the phones with an Intel modem inside" - So the Iphone did the best against iphone? Lmfao... way to try and pat apple on the back for nothing. Making them sounds like they aced an area when it was apples to phone of 2018 vs there "budget" phone of 2018... just say it like it is place them where they actually placed among ALL the devices in the test.. So pathetic. Phone Arena being bogus as usual. Most everyone knows that iPhone Intel modems give the user the slowest speed period. Seems like iPhone arena gets Apple subsidies making sure to keep them by making bogus claims about speed..... This is why I rarely come here. When you are bias in your product reviews it tarnishes your reputation..... Then when you delete posts acknowledging this further damages your reputation.